Welcome to JJ-365 Salutes. Over 2018, we pay tribute daily to one of “The Good Ones”. Today we are shining the light on Boyd Leader. 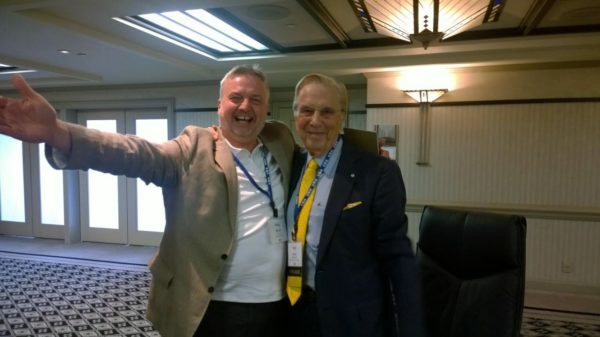 Boyd and I worked in Moffat Communications and CORUS off and on. All of us would congregate at the infamous Moffat Moose Jaw ball tournaments and that’s where we all got to know each other. If you want to build trust in an organization, it’s key to get people together outside of the normal work day. This is where people learn what they have in common, which gives them much more to talk about. Commonality is a key pillar of trust and often the grease that helps to make the social engines run. Boyd and I never worked directly but I would see him each time on my cross-country Moffatt Radio tours. He is respected as a talented broadcaster and Leader in our industry and well known for being a very funny and fun lad. Good times around Boyd for sure. “Jerry: So, let me get this straight, you’re turning down a full-time job in radio, so you can go to college and take radio in hopes that you could get a full-time job in radio? It was when he was working at CJOC in Lethbridge when he encountered Marty Forbes: “I know he’ll correct me if I’m wrong, but I believe he had a pony tail at the time; doesn’t matter, it works well for the story.” Marty was PD of LA-FM across the hall and through many conversations he thought Boyd would be a great fit with Moffat and their training station, CHAB in Moose Jaw, Saskatchewan. Marty hooked him up with then Program Director Pat Bohn and Pat hired him. He never really worked with Pat, as he was off to Hamilton almost as soon as Boyd got there. He is grateful for the chats still and would offer both a place on his couch, but in Marty’s case he says he’s not sure he’d accept because he doesn’t have a lake view. He held on-air and Program Director positions at CKGL Swift Current, CKYG in Red Deer, CHEC in Lethbridge, and CISN-FM, JOE-FM, CHED and POWER-FM in Edmonton where he was also the on-field announcer for the CFL’s Edmonton Oilers. In Calgary, he worked at AM-106, MUSIC 96 FM, and POWER FM and also became the field accouncer for the Calgary Stampeders football team. 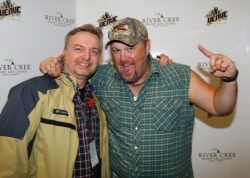 With Boyd Leader and Larry The Cable Guy Tater Chips. Not to forget CKRC in Winnipeg where the late and great Arnie Chelsie gave him the name Rhubarb Jones. 365’er Boyd Kozak was the reason he had to change his name he says: “I remember the meeting with Arnie and Doug Anderson at CKRC. Arnie: We can’t have two Boyds on the air and Kozie has been here a thousand years. Boyd: Okay, I get that. Arnie: How about, “Rhubarb Jones.” (His face was like a child presenting his parents with a gift). Boyd: That’s the dumbest name I’ve ever heard! Arnie: (Kind of disappointed, now a bit mad) It’ll work, and I think you should try it. 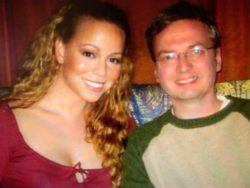 Mariah Carey and Boyd Leader. 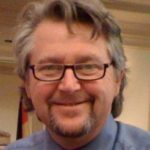 For the last five years Boyd has been the Program Director of the CFWE Radio Network our of Edmonton covering Alberta from Ponoka north servicing 85 communities including 98.5 in Edmonton, 94.5 in Ft. McMurray, 90.5 Lac La Biche, 96.7 in Bonnyville/Cold Lake/Lloydminster and 89.3 Pincher Creek/Lethbridge. His stations play the best Country Variety in Alberta and also feature specialty Aboriginal music programming. Boyd sums up: “I have never considered myself very talented, which will come as no surprise to a lot of people who would agree with me. I have however, always tried hard and worked hard at what I do. Next Valentine’s Day will mark my 39th anniversary being full time in radio – I haven’t spent a day working in radio because it’s never been a job to me. Pretty modest stuff. Let’s set the record straight: Yes, Boyd is a hard-working guy, but he is also very, very talented broadcaster, a possessor of a wicked wit and sense of humour, smart, resourceful, and a wonderful colleague. He is always fun to be around and genuiniely cares about people’s lives and careers and has thus turned out a lot of talent in his time. There are a lot of people who will keep their couch open for Boyd. Keep it going mister! This industry needs people like you. Thank you, Boyd Leader for being one of the “The Good Ones”. Feel free to like and share Boyd’s positive story. Who is the subject of tomorrow’s JJ-365 Salutes? As they say, stay tuned. Boyd is one of the best radio guys i have been associated with. Never worked beside him, but spent many years with him in the trenches at Corus. Always great fun to be around!